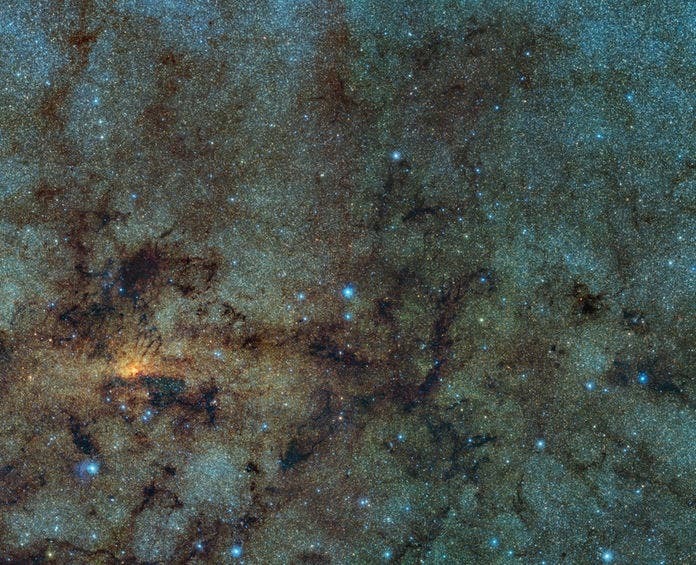 It’s normally very hard to see many of the 10 million stars populating the Milky Way’s galactic bulge because of a thick cloak of interstellar dust. Infrared light can penetrate that cloak, so a team of astronomers used data taken by the European Southern Observatory’s Visible and Infrared Survey Telescope for Astronomy and scoured the bulge for variable stars. As the researchers report online today in Astrophysical Journal Letters, they netted 12 so-called RR Lyrae stars (some pictured above), which periodically dim and brighten again. The frequency of these pulses is related to the star’s intrinsic brightness, so by measuring its pulse, you find out how bright it is. By comparing intrinsic brightness with apparent brightness, the team could estimate the distance to each star and confirm they were in the bulge. RR Lyrae stars are usually very ancient and almost always form in globular clusters—tight bunches of hundreds of thousands of stars that formed 10 billion years ago and now lurk around the galaxy’s outer fringes. Some theorists believe that the galactic bulge is formed by a merger of globular clusters, so the new stars would support that idea. Others think the bulge forms from gas and stars streamed in from the spiral arms, but if that is true, how to explain these ancient interlopers?